Today we have a guest post that is a little different for PWW365. I’m excited to welcome Rose Ann Kesting from Speech Snacks. A Fellow SLP, she loves to combine her passion for cooking with her passion for speech and language. 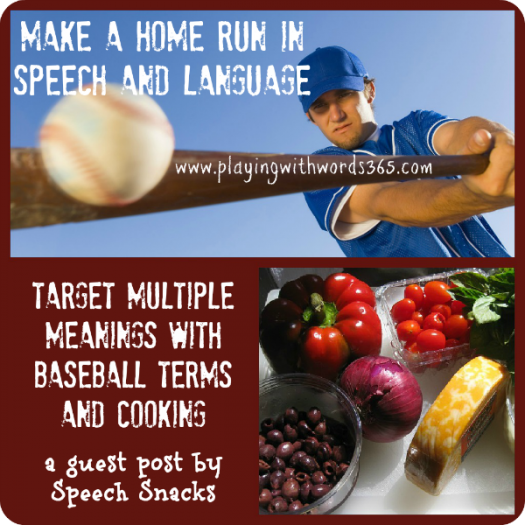 Today she is sharing with us some activities to target multiple meaning words and vocabulary building as well as some yummy recipes to go along with them…and all with a BASEBALL theme just in time for the playoffs! (GO GIANTS!!!!) Hope you enjoy! Autumn has officially arrived, along with all the sights and sounds of the season…(depending on what part of the country you live in, of course). In the northeast we are being treated to the brilliant colors of fall leaves, geese flying south and crisp, chilly nights. It’s also your last chance to watch your favorite baseball teams vie for a shot at the playoffs and possibly World Series title. So before I surrender to all foods pumpkin and apple related, I decided to pay tribute to “the boys of summer” and America’s favorite past-time! This recipe is simple enough for your little sluggers to help you assemble. 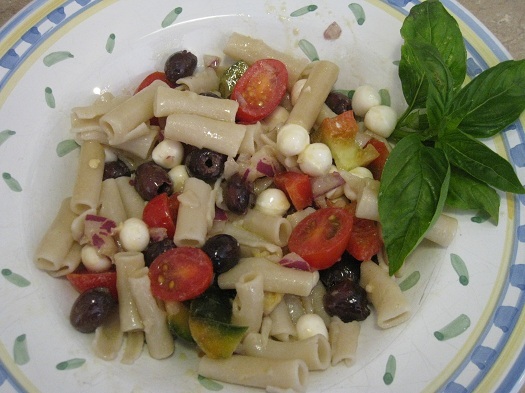 They will have fun finding and eating the “baseball bats” (tube-shaped pasta),” “strike outs,” (black olives) and “home runs” (white mozzarella balls) in their bowl of pasta salad. You can view my cooking demonstration for this recipe by visiting the “Cooking Up Good Speech” video series. Watch us assemble this simple recipe while working on our language skills. Take this delicious dish to your next baseball party as you root, root, root for the home team! Download my vocabulary game for Multiple Meanings Baseball! This is a puzzle matching game with several levels. The first level contains word cues and is color coordinated to help make it easier to identify which pairs go together. The second level is not color coordinated, and the third level contains no word cues to help identify which two multiple meaning pictures go together. Pick the appropriate level depending on the age and ability of the child. Spread out the puzzle pieces and match the two that belong together. For all levels, help your students DEFINE THE WORD MEANINGS and USE EACH OF THE WORDS APPROPRIATELY IN A COMPLETE SENTENCE. 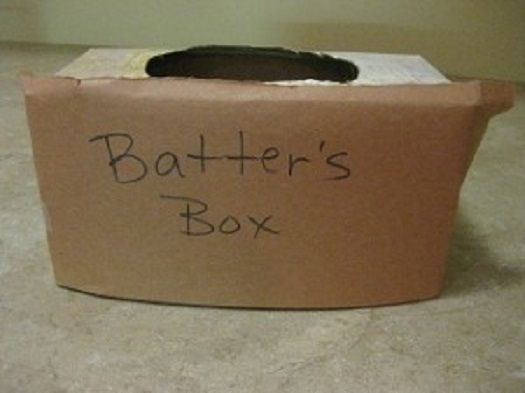 As another option, you can take an empty tissue box and write the words “batter’s box” (pardon the literal interpretation–I couldn’t help myself!!) on the side of it, then add all your puzzle pieces. Have the kids take turns reaching in and pulling out each piece. See who can come up with the most matching pairs. This is also a good opportunity to see who can explain what a batter’s box really is on a baseball field. Print out the levels here: Level 1, Level 2, Level 3 (please glue to card stock or construction paper and laminate for better durability) **Special thanks to Custom Boards by Smarty Ears for the great template and symbols! Want another baseball themed recipe and speech/language activity? Take a look at my post on Homemade CrackerJacks—you’ll never buy another store-bought box!!! 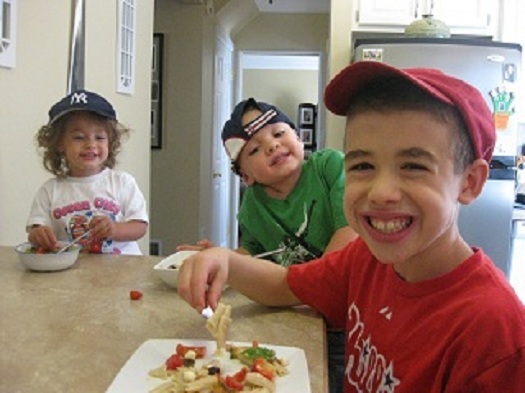 Check out Riley (age 2) , Caiden (age 3) and Joseph (age 9) as they have fun helping me assemble the pasta salad while working on language skills at the same time! Watch the video for ways to address vocabulary with a variety of age levels—-fun and delicious learning opportunities for everyone!! 1 package (16 ounces) tube pasta—I used BROWN RICE PASTA instead of white or wheat pasta—it’s gluten free and a healthy alternative!! An adult should take care of all the prep work (chopping and cutting) but let the kiddos POUR and MIX the ingredients! Give them the ORDER that you want the ingredients added in, then ask them to REPEAT the ingredients back to you. 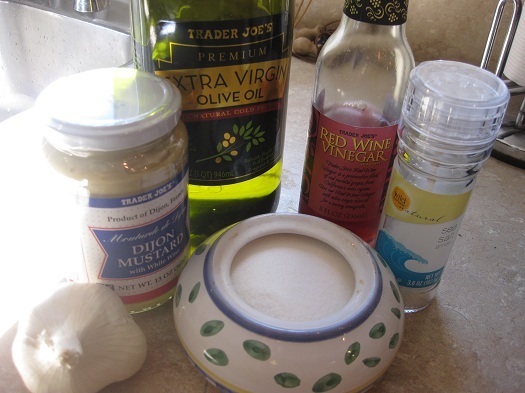 Next have them put the ingredients in the bowl in the correct order. For younger kids, ask them to remember only 2-3 ingredients, for older kids, challenge them to repeat back several or all of the ingredients and add it in the correct order! Cook pasta according to package directions; drain and rinse with cold water. 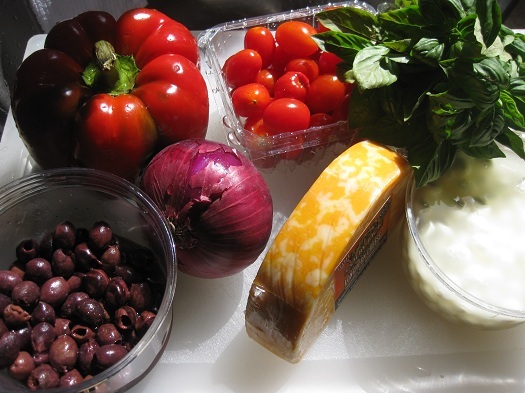 Place in a salad bowl; add tomatoes, cheese, peppers, onion, olives and basil. When making the dressing, let your kids work on MEASURING and IDENTIFYING FRACTIONS by having them help you pour the liquid ingredients to the correct line on a measuring cup! Remember to measure at eye level for accuracy! Keep Score as you Eat! How many STRIKE OUTS (black olives) and HITS (mozzarella balls) can you find in your serving of STRIKE OUT SALAD?? Have fun adding them up and keeping score!! Great idea. Can’t wait to try this with my little one. And the recipe sounds so delicious. Thanks. Love the baseball theme! Go Cubs!! 🙂 THANKS!